The ability of microorganisms to attach to diverse surfaces and form complex colonies known as biofilms vastly improves their survival and growth in environmental niches. Biofilms form when bacteria adhere to surfaces by excreting a slimy, glue-like substance, and can include algae, protozoa, and other microorganisms. Nationally, biofilms cost the US billions of dollars every year in energy losses, equipment damage, product contamination, and medical infections.1 Although we have written in the past about biofilms, the good and bad, this article focuses on their role in microbiological drinking water quality-specifically biofilms in distribution systems. Fortunately, chemical and physical options are available for controlling biofilms, especially in aging drinking water systems, since total elimination is virtually impossible to achieve or maintain. Because disinfectants alone cannot eliminate biofilms, reducing nutrient levels can help reduce their growth. Further, so-called “booster disinfection” to maintain disinfectant levels throughout the water system can help. Chloramine as a secondary disinfectant for water from the treatment plant to the tap may penetrate biofilms better than chlorine alone. Physical control methods can also be effective, especially for well-established, “mature” biofilms. 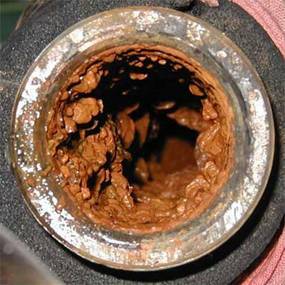 For example, flushing water through pipes at high velocities can help remove biofilms from smooth pipe interiors. Controlling biofilms remains an important and challenging step in safely delivering high microbiological quality water-particularly in healthcare environments where there are many sensitive populations-and especially given the steadily advancing age of much of our nation’s water infrastructure. 1 Biofilm Basics: What are biofilms? https://www.cs.montana.edu/webworks/projects/stevesbook/contents/chapters/chapter001/section002/black/page001.html. 2 American Water Works Association (2012). Buried No Longer: Confronting America’s Water Infrastructure Challenge. http://www.awwa.org/Portals/0/files/legreg/documents/BuriedNoLonger.pdf. 3 Rozej et al. (2015). Structure and microbial diversity of biofilms on different pipe materials of a model drinking water distribution systems. World J. Microbiol. Biotechnol. https://www.ncbi.nlm.nih.gov/pmc/articles/PMC4282696/pdf/11274_2014_Article_1761.pdf. 4 Water Research Foundation (2016). State of the Science: Plastic Pipe. http://www.waterrf.org/Pages/Projects.aspx?PID=4680. 5 Folkman, S. (2014) Validation of the Long Life of PVC Pipes. http://www.eng.usu.edu/mae/faculty/stevef/USUPVCLongevity.pdf.